Hard-boiled eggs are easy to work into your calorie budget, but that isn't all they can do to help you lose weight. Eggs support weight loss by keeping hunger at bay and preventing big spikes in blood sugar. The protein in eggs preserves muscle mass so you can burn fat, and other nutrients in eggs support the metabolism of carbs and fat. Hard-boiled eggs also contribute essential nutrients, including vitamin B-12, vitamin D, selenium and protein. 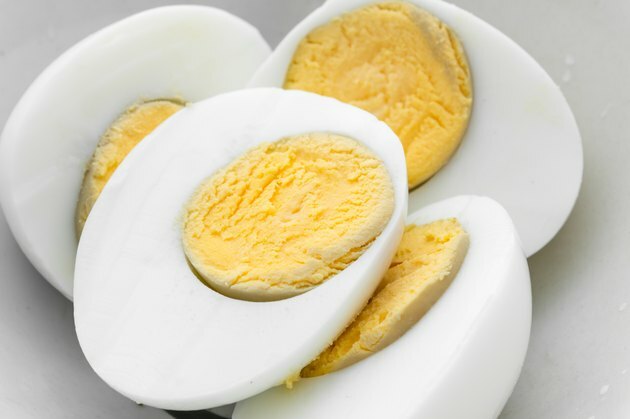 Read more: Will Hard-Boiled Eggs Help You Lose Weight? Weight loss comes down to making the body use stored fat for energy, which is accomplished by consuming fewer calories than needed for energy. Hard-boiled eggs work well for cutting back on calories because one large egg supplies only 78 calories. The cooking method makes a difference, though, as eggs gain extra calories and fat when they're fried or scrambled in butter or other fats. In spite of the moderate number of calories in an egg, keep an eye on the number of eggs you eat. The cholesterol from eggs has only a small impact on blood levels of cholesterol for most people. Healthy individuals can eat up to one whole egg daily without worrying about increasing their risk of heart disease, reports the Harvard T.H. Chan School of Public Health. It's recommended that people who have high cholesterol, diabetes or cardiovascular disease limit their egg yolk consumption to no more than three weekly. If you want to eat more eggs, just remove the yolk. Even if a little yolk residue remains on the egg white, you'll still eliminate most of the fats, including the cholesterol. Without the yolk, you can eat quite a few additional eggs because there are only about 17 calories in an egg white. For example, an omelet made with one whole egg and three additional egg whites contains only about 130 calories. High-protein foods move through the digestive tract more slowly; as a result, you feel full longer, and it's easier to eat less. Proteins also help prevent spikes in blood sugar. When blood sugar spikes, it subsequently cycles down to a low level, which triggers hunger and leads to unnecessary eating. Avoiding high blood sugar also lowers the risk that excess sugar will be stored as fat. Another important advantage you'll get from eating protein is that it preserves muscle mass. Atkins reports that in a study conducted by Dr. Donald Layman, a professor of nutrition at the University of Illinois Urbana-Champaign, two groups of overweight woman ate the same number of calories but different amounts of protein for 10 weeks. The study found that the group that ate 30 percent of their daily calories from protein lost more fat and less muscle than the group that consumed half that amount of protein. Eggs contain quality protein that's highly digestible and contains a sufficient amount of all the essential amino acids. One large hard-boiled egg provides 6 grams of protein. Since women need 46 grams daily, and men should get 56 grams, one egg supplies 13 percent and 11 percent of the daily value, respectively. Since the protein is split fairly evenly between the yolk and the white, you'll lose almost half of the protein by eating just the egg white. Several studies point to the weight-loss benefits of eating eggs for breakfast. According to Healthline, in one study, two groups ate the same number of calories for breakfast, but one group ate eggs and the other had bagels. After eight weeks, the egg-eating group lost 65 percent more weight and 16 percent more body fat. The researchers concluded that eggs can improve weight loss when they're part of an energy-deficit diet. An earlier study found that participants who had eggs at breakfast ate less food several hours following their meal than those who ate bagels. Eggs are one of the best sources of choline, an essential nutrient that must be obtained through the diet. Choline facilitates the digestion of fat and is used to produce the neurotransmitter acetylcholine, which is important for memory and learning. It also regulates fat metabolism in the liver, where it helps prevent excess fat accumulation. Although more research is needed to verify the results, one study found that choline helps female athletes rapidly reduce body fat, according to a 2014 article in the Journal of Human Kinetics. When eggs are part of a low-carbohydrate diet, they help increase levels of adiponectin, a hormone that boosts metabolism and helps the body break down fats. It also lowers inflammation and improves the body's ability to respond to insulin. Eating one egg daily improves inflammation more than a breakfast of oatmeal in people with diabetes and doesn't affect blood glucose levels according to a study published in the journal Nutrients in 2015. This study also suggests that eggs may not increase the risk of heart disease in people with diabetes, but consult your physician to be sure they're safe for you to add to your diet.